This Michigan Fatality Assessment and Control Report reviews fatal back-up injuries caused by vehicle blind spots and presents measures for prevention. Fifteen (15) work-related fatalities have occurred since 2001 while a vehicle was backing up. Construction activities accounted for 9 of these fatalities; dump trucks were involved in 5 fatalities. Other vehicle types include an airport tug, a farm tractor, a cement mixer, a forklift, a fuel truck, a utility bucket truck, a road grader, a window delivery truck, and a semi-truck. 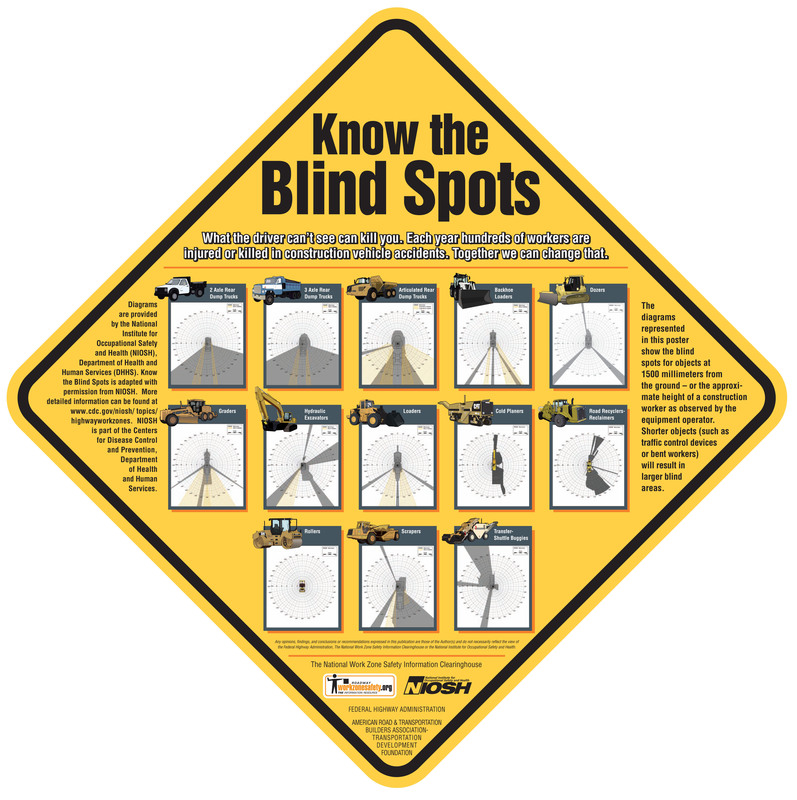 A blind spot is the area around a vehicle or piece of contruction equipment that is not visisble to operators, either by direct line-of sight or indirectly by use of internal and external mirrors. Use Spotters wearing reflective vests when the driver has an obstructed view; the truck contains extended components (such as a crane); or when someone or something could enter the driver's backing path. Install after-market presence detectors on vehicles. Systems include cameras, additional mirrors, ultrasonic sensing and radar. Develop Standard Operating Procedure (SOP) for backing vehicles. Develope Driver backing vehicle training. Training should include: driver stopping vehicle if he'she cannot see the Spotter, performing a walk-around to determine obstacles/hazards and site/vehicle clearances, sounding horn prior to backing, and demonstrating backing competency. Develop Spotter backing vehicle training. Training should include: signals to be used and agreed upon with driver, maintaining eye contact and a safe distance from backing behicle on the driver's side, and demonstrating spotter competency. Learn vehicle's blind spots. Consult NIOSH Highway Work Zone Safety, Construction Vehicle List (See NIOSH web reference). If vehicle not listed, estimate vehicle blind zone: Sit in driver's seat, have another person walk away from vehicle until driver can see his/her feet, measure distance. For side and rear, repeat process using side/rear view mirrors. Area within measured distance is blind zone. Develop an Internal Traffic Control Plan (ITCP) to reduce vehicle backing in work zones and to establish truck lanes and pedestrian walk paths. Adjust driver's side mirror to point just past where you can see your car. Adjust passenger side mirror to point just past where you can see your car.